KCC tank, trench and sump linings include Urethanes (UR), Amine Adduct Epoxy (EP), Epoxies (EP), Epoxy Novolacs (EN), Hybrid Polymers (SMR series), Polyesters (PC/PB) and Vinyl Esters & Novolac Vinyl Esters (VE), as well as KCC's new Grafted Polymer Series (GP). 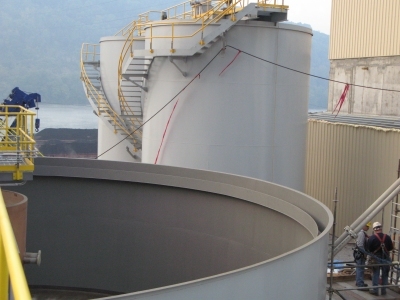 Tank & trench linings polymer selection depends on the chemical environment and temperatures as well as any expected abuse or mechanical loadings imposed by the substrate. the environment expected during field installation. In addition, a host of supporting primers, bonding agents and repair mortars are all perfected and all are engineered to match the selected product for your application. All KCC tank & trench linings are suitable for both steel and concrete substrates, in splash & spill and full time immersion conditions. All KCC Thermosetting linings are designed for maximum resistance to molecular permeation, a critical issue for full time immersion conditions, for maximizing performance and long life. KCC linings set new standards in permeation resistance using "state of the art" nanocomposite primers such as P 4.0, which excels in blocking molecular permeation, sets new standards in wet strength adhesion while pushing KCC linings capabilities well ahead of other so called competitive offerings. Our newest technologies developed specifically for Electric Utilities in FGD applications is also finding wide spread use in other industries in chemical applications. VE 62 is a spray applied lining applied a total of 60 dry mils. VE 62 was designed specifically to provide all of the advantages of a trowel applied 80 - 100 mil lining with large aspect ratio flakes in a lower cost, spray applied lining system. VE 62 exceeds all the performance characteristics of trowel applied linings in every way; in molecular permeation resistance, abrasion resistance, chemical resistance, long life and VE 62 is applied at lower cost because it is spray applied versus being trowel applied. VE 62 is now being specified for new FGD projects all over the US as a cost effective, superior long term lining to replace the old trowel applied materials. How is VE 62 so effective? VE 62 incorporates KCC's P 4.0 nanocomposite, moisture blocking primer, and KCC's unique proprietary flake filler that uniquely and completely bonds to the resin matrix, leaving no path for molecular water migration, and the polymer system is carefully balance for performance characteristics that competitors just cannot match. In summary, VE 62 is the very latest polymer technology in a familiar novolac vinyl ester polymer. Other new and exciting KCC linings include the Grafted Polymer Series (GP) polymer system that incorporates both thermoplastic and thermosetting technologies in a single high performance lining system that also is superior in blocking molecular permeation, performs in temperature ranges from - 60ºF (-51ºC) to 24ºF (115.5ºC) in splash & spill and full time immersion. This 100% solids, airless spray lining is unbeatable in performance, installed cost and in critical performance characteristics. In order to be certain of meeting our customer's many and critical requirements, KCC provides tank & trench linings in spray, roll and trowel grades as required. Abrasion resistant properties offered by KCC are the most advanced with our AR3 version defeating every major supplier of FGD linings in independent tests with direct impingement of fly ash. And we did not just win the test, we outlasted the other guys by a factor of four times, and we have continued to raise the bar as KCC is a relentless innovator in polymer technology. 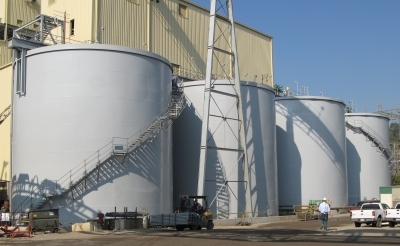 KCC Tank lining applications included Storage Tanks, Mixing and Reactor Vessels, API Separators, FGD Absorbers, Stock Chests and a wide and varying variety of tanks, vessels and trenches in all industries in all type of chemicals and temperatures. KCC R&D is pushing hard on the boundaries of tank & trench lining technology, working for you to raise the max operating temperatures to break through the 240°F (115.5°C). We are making excellent progress, so you can look to KCC as usual for the future technological breakthroughs in corrosion resistant polymers. KCC continues as the Leader in High Performance Polymer Technologies.